Well, the leaves don't change much here in fall (we're actually in Winter since the 1st of June, but it's really hit last week, cold wet weather, and the leaves rarely turn red! I do miss that about the cold crisp air of the morning, seeing those beautiful colour changes in the leaves...). Well, doesn't matter as my soap is doing a little colour changing of its own. It's not fully cured yet, but I thought I'd show you the colour changes in this soap, in which I used a Pink Ultramarine. 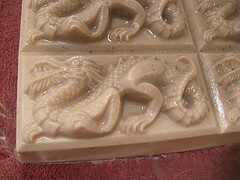 This soap is the Rhubarb al Fresco, it went really yellow (no other colour added to the soap, just the Fragrance Oil (FO). Where's my tuque and my mittens??? I just wanted to stop by and thank you for visiting my blog and then commenting with the tip and the link to your website and the recipe for the sugar scrubs! I printed out both the fudge and the M&P versions and I am anxious to try both of them. Which would you recommend trying first? I have a party coming up in less that 7 days and want to make some! Good luck and enjoy the rest of your summer (oh, yeah, it is fall! rofl!) In the many years that I have traveled, I had the joy and pleasure of making many Aussie friends and they are wonderful!